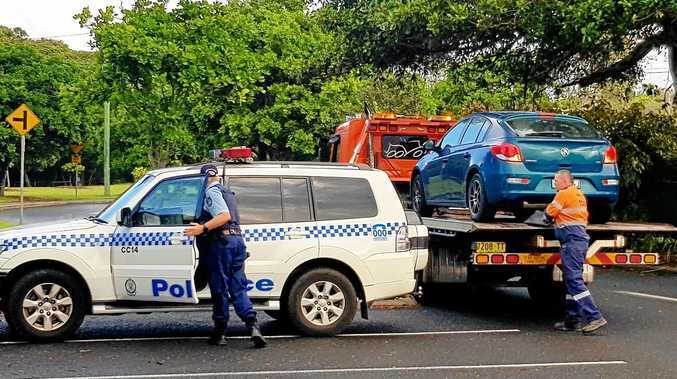 A MAN who led police on a peak-hour car chase from Coomera at the northern end of the Gold Coast to Bangalow is expected to appear at Lismore Local Court today. The 29-year-old man reportedly sped away from police in a blue Honda Civic at Coomera about 5pm yesterday and sped south, weaving through commuter traffic as he went. The man made it from Coomera to the NSW border in 45 minutes, crossing over into Tweed Heads at 5.45pm, a statement from NSW Police says. Officers from the Tweed-Byron Local Area Command, aided by a helicopter from Queensland Police's PolAir division, took over the chase but were forced to abandon it soon after due to safety concerns. The drama ended about 6.30pm when the car stopped at roadworks for the Pacific Highway upgrade at Bangalow and the man tried to escape into nearby bushland. The man and a 26-year-old woman were both arrested with the woman being taken to Tweed Heads hospital to be treated for injuries she suffered in the car's sudden stop at Bangalow. It was not clear what the woman's injuries were and police have not said she was charged over the chase. The man was taken to Byron Bay police station where he was charged with (in the wording of the charges) police pursuit-not stop drive dangerously, police pursuit-not stop drive at speed, drive while disqualified, and drive manner dangerous. The man was held in custody to appear at Lismore Local Court today and NSW Police expected their Queensland colleagues to seek his extradition "at a later date". Officers are still investigating the chase. Anyone with information should phone Crime Stoppers on 1800 333 000.